What just happened? Back in December, Google announced that Project Tango would soon be shuttered. Its initiative to bring augmented reality to mobile devices was being replaced by ARCore, which doesn’t require specialized hardware such as depth-sensing cameras and sensors. Now, one of the best and most popular Tango apps has made its way to ARCore phones: Measure. 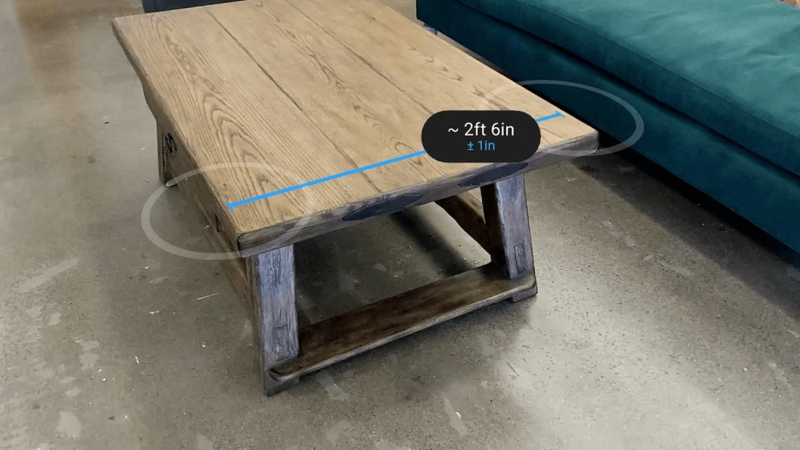 Measure, which was one of the few pre-loaded apps on Tango devices, is getting an update that allows it to work on any ARCore-compatible phone. Here’s a full list of supported handsets, which range from some cheaper devices up to flagships such as the Galaxy S9 and all of Google’s Pixels. The feature requires Android 7.0 or later, though for some phones it’s Android 8.0 or later. Measure, as the name suggests, is essentially a digital tape measure, though the app does state that the measurements it takes are estimates only. Once it’s been calibrated, which involves moving a phone around so it can scan an area, you then use either the length or height tool by dragging either one onto the camera’s viewfinder. Surfaces appear with a grid of dots, and you simply move the bars to measure something. You’ve also got the option of saving the photo so you don’t have to remember them or write anything down. As the app notes: it’s not exactly precise. Smaller measurements can be off by around half an inch, while the margin for error with something larger can be several inches, but the app can be useful for estimating the height/length of certain objects, especially those where using a physical tape measure can prove difficult. Earlier this month, Apple introduced ARKit 2.0; it’s updated AR platform. Additionally, it unveiled an app similar to Google’s, also called Measure, which is coming to iOS 12. It’s possible that Google has updated its version to work on ARCore phones as a response to Apple’s announcements.